It's been a great week! I love Summer and I love spending time with the kids outside doing fun things - so much better than trying to find something suitable for all three of them to do at home. And a summer like this one doesn't come round every year in Old Blighty! I'm taking full advantage of the weather before it changes! Saturday we went to a party at Fairfield Orchard (my Wordless Wednesday post this week) where the kids played traditional party games out side in the sunshine and played amongst the apple trees. A genius idea if there ever was one. 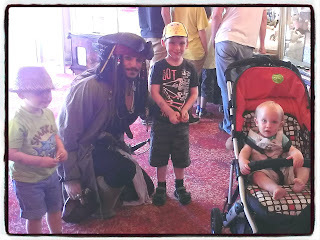 Sunday we did the Madame Tussauds review, but we also bumped into Captain Jack Sparrow himself (well, a damn good look-a-like) in Carol Island. 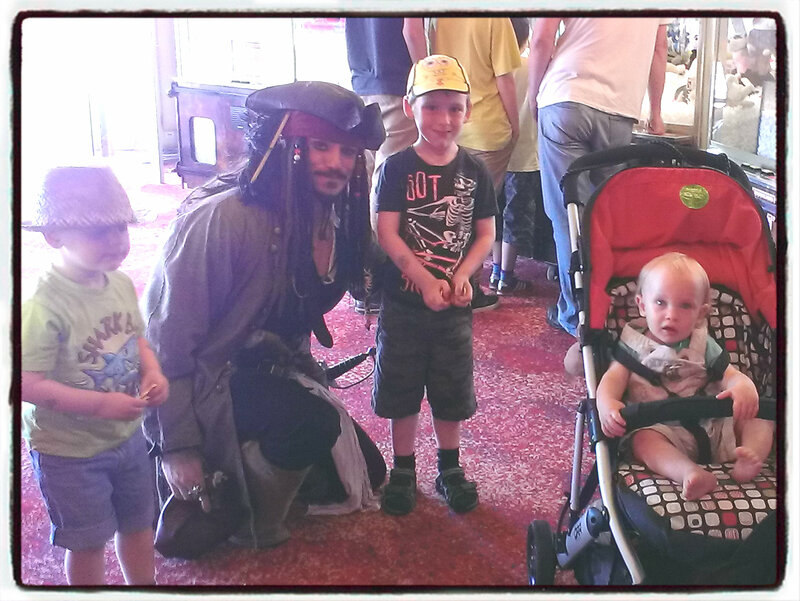 He gave the kids chocolate pirates treasure and had his picture taken with them. I desperately wanted to get a photo of myself giving him a snog but felt the hubby would disapprove! And then we had a good long play on the beach, splashing in the sea - the first time Tom has ever felt brave enough to get his feet wet. The sea was actually WARM! It was such a wonderful day that I was still grinning ear to ear when we went to bed! 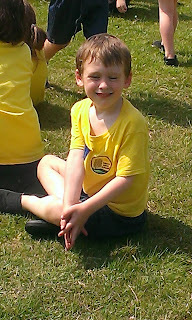 Monday was normal for most of us, but Jack went on a school trip to Dalton Zoo and has an amazing time. the weather was that little bit cooler and just right for the day. He came back with stories like when a lemur stole one kid's apple & orange and a keeper had to shoot it with a water pistol! 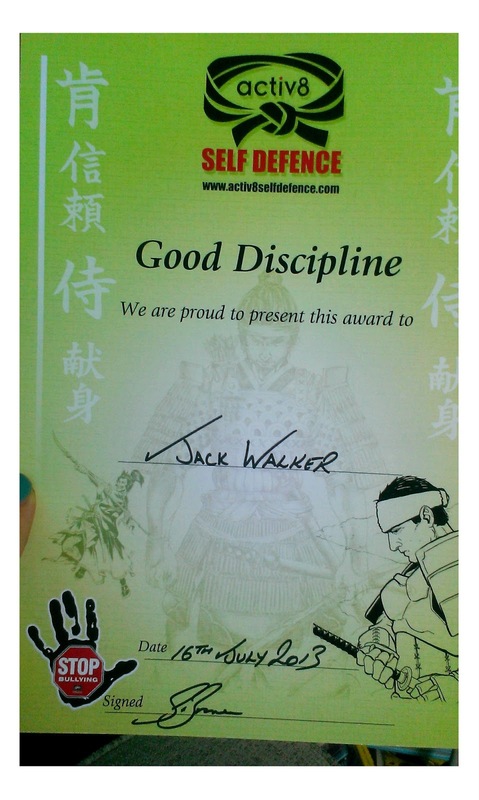 Tuesday and my Big Lad came home from his last Jujitsu lesson of the school year with a Good Discipline award, meanwhile I took the Tom & Georgie on a trip out for sweeties and sun glasses and other Summer Time goodies, and a cafe lunch. Wednesday was another scorching hot day and I was stuck at work. It was also school reports day! Nursery kind of sprang it on me when I was already late for work so I've had to reschedule that for his last day next week. Jack's was a written report that he came home with. I couldn't be more proud with "Exceeding" expectation in all but 2 areas, and those two areas were still pretty damn good. I'll have to get a scan of that report to send to my dad in France! Thursday was Willow Lane's Sports Day, and I got to go since it's not a work day for me! Boiling hot again. Allegedly the best sports day weather since 2006! Jack didn't win any races but says he had so much fun that it didn't matter. He told me it was taking part that counts, and I that makes him the best kind of winner to me. Today I'm working. But it's a a week since I came off the pill (Saturday was my last one) and now we're looking forward to that 4th and final baby which will make our family complete! Awesome week! The weather promises to be fabulous over the weekend and into next week too. Jack finishes school on Tuesday, Tom finishes Nursery on Wednesday... and one week today I'm whisking my family off on a Welsh Adventure! Did I mention I LOVE SUMMER? !